The TWG Tea Salon and Boutique in Pavilion Kuala Lumpur looks like a quaint oasis in the centre of the luxury couture street. One who did not know better would be surprised to stumble upon this isle of food and beverage in a sea of handbags and watches. Yet, while flanked by the likes of Versace and Bulgari, the tea boutique has a classy elegance to its polished facade, befitting of one of the world’s finest luxury brands in tea. The splendour continues inside, in the form of colourful macarons lined up inside the glass counter right in front of the entrance. Rows upon rows of tea canisters line the shelves to the side, while square boxes pile on the central display islands, each storing one of hundreds of TWG teas. 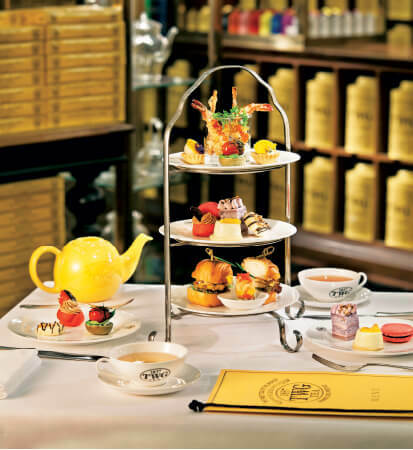 Other than a wide array of gourmet teas, TWG Tea is also known for their high tea. With its origins dating back several centuries, high tea has since come to mean scones and sandwiches served on a tiered tray. While TWG Tea does serve this typical version of high tea, it is with their Grand High Tea that they challenge the stereotype. The latest seasonal rotation features a menu inspired by the flavours of the Oriental World, a toast to the recent Chinese New Year celebration. As the Grand High Tea is set on the table, it is clear that presentation is taken seriously in the TWG kitchen. Three-tiers of mouth-watering treasures sport lovely colours — the savoury bites flaunt rich greens, yellows and oranges, while the sweet treats come in flirtatious shades of reds and purples. The twenty daintily created morsels are arranged beautifully on their trays, a visual pleasure that demands a spot on one’s Instagram feed even before reaching out for the first bite. A good way to begin the gastronomic journey is with a refreshing salad-like Salmon Timbale. A tiny tower of salmon, mango, tomato and avocado slices, it is a delicate, bite-sized version of the popular dish. If Remy the rat cook from Pixar’s Ratatouille had attempted timbale, this would be what it would look like. In the Matcha Green Tea Brioche, the flavours of matcha, tomato, cream cheese and basil are brought together. While not a personal favourite, the different components in this unlikely union eventually work out to create a unique taste on the palate. The clear star of the show is the Saffron Chicken, sandwiched in a golden brown mantou bun. While resembling a mini cheeseburger cut in half, it marries the best of Chinese street food with the refined flavours of the gourmet kitchen. The chicken is seasoned to perfection, and is the perfect filling for the light and crispy bun, which is only further enhanced with a dusting of oolong tea. Coming in as a close second favourite is the Almond Crusted Tiger Prawn. Fans of Japanese tempura will fall head over heels in love with this fellow crunchy prawn, bursting with the fragrance of almond oil and tinged with a little punch of sriracha chili. Put together like a little cheese tart in a sable base infused with Earl Grey, the Foie Gras Dome is topped with a thin layer of mandarin jelly and adorned with a clitoria bloom. While it could easily pass off as a dessert, one bite into the rich, buttery mousse is enough to convince you of its status as a savoury item. The foie gras mousse has a smooth and creamy texture, yet remains an acquired taste with its strong flavour. Moving on to desserts, the mandarin orange cheesecake puts an Oriental spin on a classic Western favourite. It is a very welcome fusion, in ways similar to lemon cheesecakes. A personal favourite was the Yam and Pistachio Sponge Layer Cake, which was nothing short of brilliant. The alternating layers of cake and cream are each of just the right density, fitting together almost seamlessly. Even for one who has never had a liking for the flavours, this cake is a game changer. The cream imparts a more subdued taste of yam while not being overbearingly sweet — perfect for the weight-watchers out there. If you are the type to seek out sweeter desserts, however, the Macaron and the Red Choux will both put a smile on your face. Both come in rich red hues in the spirit of the season, and taste of sweet berries paired beautifully with a chocolate filling and a caramel ganache respectively. To wrap it all up, the Seasonal Peanut and White Chocolate Biscuit is a gourmet taste on the staple Chinese New Year snack. Of course, high tea is not high tea without tea itself. The Grand High Tea set comes with two pots of tea of your choice from the extensive TWG catalogue. A personal recommendation for this pairing would be the Breakfast Yuzu Tea and the Miraculous Mandarin. The former is a fragrant blend of several green teas infused with a light hint of citrus, and as the name implies, is perfect as the first sip of the day. The latter is a vivacious black tea with character, carrying the aroma of orchard fruits for an invigorating punch of tartness. While high tea is not typically on the list of must-eats during Chinese New Year, this Oriental Grand High Tea is well worth going against tradition for. Defying the barriers of what usually constitutes high tea, this Grand High Tea is a notable addition to the growing trend of East-meets-West fusion cuisine. The Grand High Tea is priced at RM118 for 2 persons, and is available at TWG Tea Salon and Boutique in Pavilion KL, The Gardens Mall, and Gurney Paragon, Penang. For more information, visit www.twgtea.com.